Singapore has banned smoking in a very long and ever expanding list of public places, but there still seems to be no way to escape second hand smoke. I’m extra conscious of it when I’m with Sophia. Despite the seemingly comprehensive ban, Sophia is still constantly subject to the harm of tobacco. 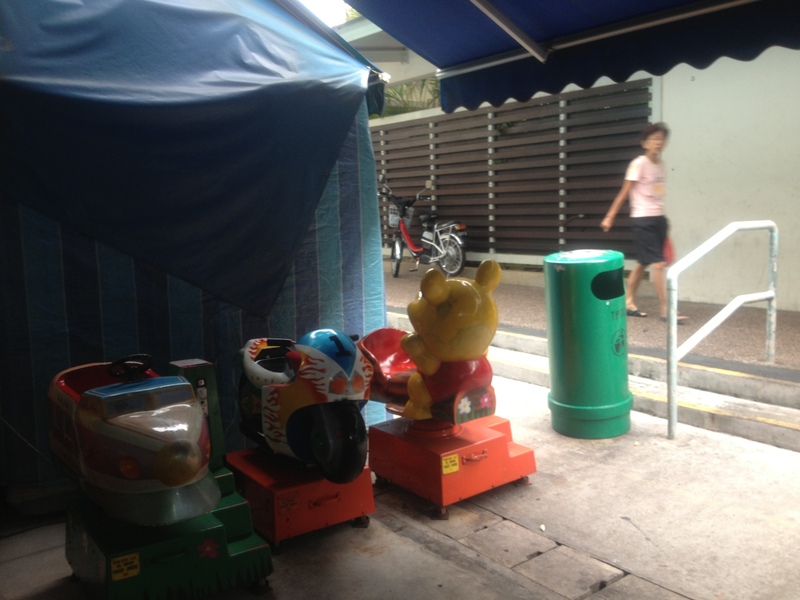 Next to a food center that we were eating at last weekend was this group of kiddy rides. While Sophia hates a moving kiddy ride, she remains attracted by the colourful structures and enjoys just sitting on them and pretending to drive/ride. So naturally she kept asking to be brought there BUT there was a man standing next to the bin right next to the Winnie the Pooh ride puffing away for the longest time. I waited for a good 15 minutes for the toxins to clear before allowing Sophia to go over and noticed that there were cigarette ashes on the rides closest to the bin. Perhaps bins with ashtray facilities should never be anywhere near kids facilities or, indeed, any place that people may hang around for any length of time. Actually the hubby says the japanese got it right with smoke boxes and Singapore should import these and have a general ban on smoking except in these boxes. I can imagine the smokers being mighty unhappy about it but if there are enough of these around to not inconvenience smokers and a sufficiently good filtering system such that the smoke is drawn out but does not harm people outside the box, I’m for it. Perhaps the government’s investment in this can be incremental. The law can say that it is illegal to smoke within 50m of a smoke box, because smokers have no excuse not to head to one so close away, and as more smoke boxes get installed, more of Singapore becomes smoke free. Building regulations can say that all new buildings need to be fitted with a smoke box so people will smoke there instead of outside the buildings along pedestrian walkways. What do you guys think? Is this yet another case of me being a neuro protectionist mum or are you guys also concerned about your children taking in second hand smoke? 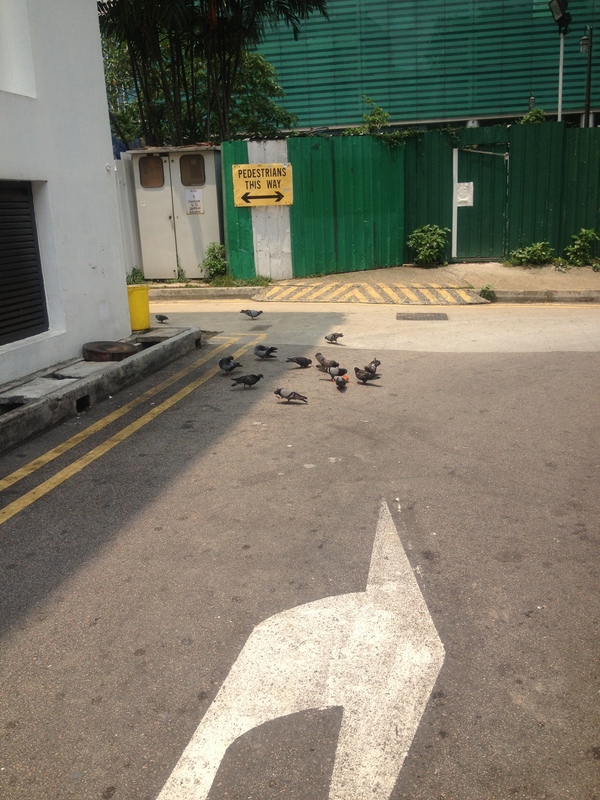 Around my home and on many of the paths which I HAVE to take on the way out and to key places that I often go to like the office, the MRT station, there are many pigeons, which we all know, is a health hazard. However, it seems that many do not quite understand why so as I saw someone freaking out when a pigeon flew over her baby, frantically waving her arms in the air in a fanning motion and murmuring something about “powder” from the bird. In fact, the danger from pigeons is largely not from the birds themselves but from the droppings which may contain certain fungus and bacteria, some of which may become airborne when they dry up. Unfortunately, these droppings cover many of the paths that my family cannot avoid everyday, some inside my condo development and some outside. Feeding grounds nearby are numerous – the rubbish bins used by the restaurants in the lane right outside the development, the food centers nearby and the temple(s) that leave food out as part of their offerings. After having their fill the birds come over to roost and sometimes have a drink at the swimming pool. My condo management office is not doing anything about it other than advising us to install nets keeping the birds out of our house, which does not help the situation in the public areas, some of which we cannot avoid such as the only lane leading out from the lift lobby. I’ve alerted AVA so they can look into whether there is anything they can do outside of the condo to remove the sources of food (it is illegal to feed pigeons after all). We have also been carrying Sophia when we pass places with a high density of pigeon droppings but I also don’t want her to get into the habit of being carried. Any ideas how to protect my little one from potential infection? 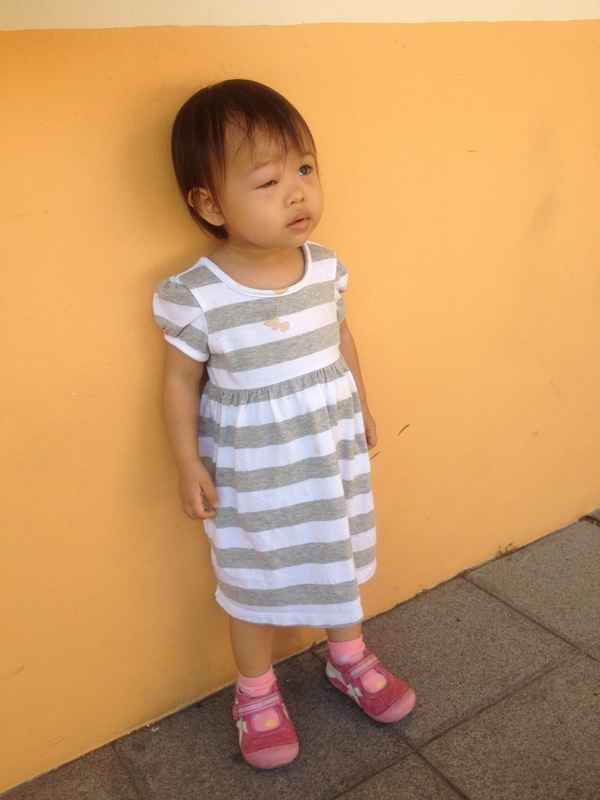 Got a second medical opinion because, on top of her eye swelling up again, large angry patches appeared on her leg. The first diagnosis of hives came from Sophia’s regular pediatrician. This time, we went to the family doctor that I have been going to since I was a child because he also has a special interest in dermatology although he is not a dermatologist. His opinion is that it is some sort of insect bite. So now who should we believe and what should we do about the rashes, blisters and all?? Btw, the husband, who claims to be the expert in hives having suffered through it for more than 30 years, opined that it is hives as hives tend to be clustered around one area and not in such disparate places as head and ankle. Who am I to know? That’s not her winking at you; that’s her with one eye so swollen she can’t open it. 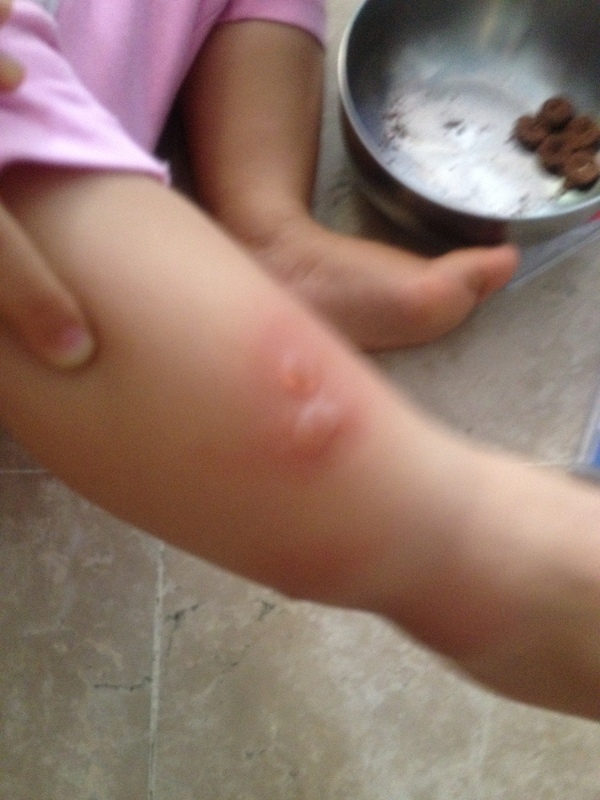 We think its a mosquito bite but as usual she has to develop strange ailments like this on a public holiday where all her usual physicians are not working. We’re reluctant to bring her to A&E departments because (i) if it really were a mozzie bite we would really look quite silly waiting hours to be told that and (ii) last time we went to KKH’s A&E we went off not feeling too confident of the very young non-local doctor’s judgement and brought her to her usual doctor the next day so it seemed rather like a waste of time. Here’s hoping the swelling will subside soon! What was I thinking, running the JPM Corporate Challenge after not running for more than 2 years and having a child in that time? When I crossed the starting line, I was squeezing my way forward among the crowd, completely ignorant of how unfit I am at the moment. 300 meters of this left me exhausted and I had to content myself with a slow jog while runners overtake me from all over. After what seemed like eternity I spotted the 2km sign and at about the same time my right knee started to hurt. Nevermind I can do it. I shall not stop for rehydration because once I stop running I tend to develop a stitch. So on I go, jogging jogging… at about the 3 km mark I realise I have a glimpse of what its like for Terry Fox because each step brings a sharp pain in my knee. step… ouch… step… ouch… I finally reached the point where I turn back. Bottleneck. Its not even moving. I jogged on the spot like an idiot again worried I won’t be able to get myself started again. After 4 traffic light turns of jogging virtually on the spot, I finally clear the u turn and start running again. Huff puff… Rehydration station ahead at 4km. Heck it. I need water. I stopped and grabbed a cup. Kicked myself for being an idiot at the earlier rehydration station because the water helped so much. I have strength to go into a faster trot. But not for long because the 100m or so of sprinting hurt my knee too much. In fact, beacuse of overcompensation, my left ankle is hurting too. Slow to a jog again. Remind self of how I’ll be able to brag on my blog that I ran all the way, nevermind that my timing is potentially slower than a brisk walker. Jog jog.. finish line in sight. Dash.. ouch.. ok jog. Yay! Cleared 5.6km without walking. Pats self on back. After celebratory drinks I limp home with a hurting knee hoping to be able to shower and collapse in bed but see that baby’s room’s lights are still on. She’s still playing with grandpa!!! Off with the lights. After a lot of pacifying, she finally sleeps at an unearthly hour (for her). And off to bed for me too…..
Hopefully this will be the start of a healthier lifestyle (ie some exercise at least) for me! At times like this I kick myself for stopping breastfeeding.